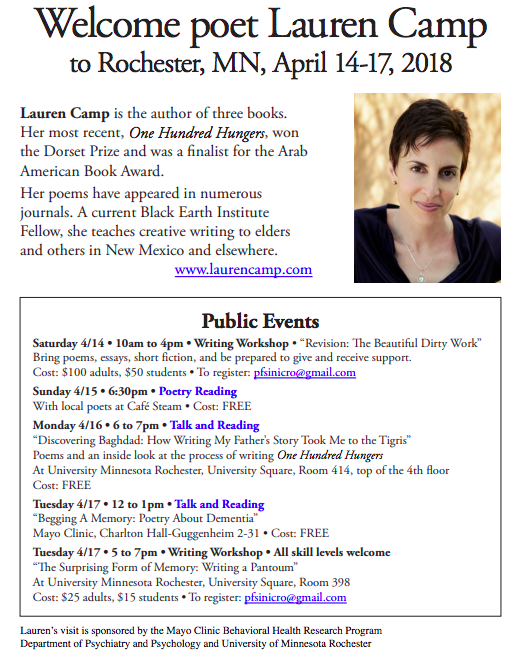 Current BEI Fellow Lauren Camp will be touring Rochester 14-17 of April. The visit is sponsored by the Mayo Clinic Behavioral Health Research Program Department of Psychiatry and Psychology and University of Minnesota Rochester. Public events during her tour include events such as writing workshops; a poetry reading with local poets; talks about the process of writing her book, One Hundred Hungers; and readings from the book and of her poetry. In addition to her public talks, she will be talking at two high schools one with highly gifted kids involved in a writing seminar and another with kids from the alternative learning center, who are struggling to complete high school.